Here at Quilt and Sew, we are “abuzz” with excitement as we participate in the Todd County Bale Trail. Here is a link that will help you plan a fun drive through the county to view the very creative entries. Congratulations to Janice Shock, the winner of our October drawing for a $25 gift certificate. Make sure you fill out an entry each time you make a purchase! Our next drawing will be November 1st. Do you realize that Christmas is less than three months away? How are your Christmas sewing projects progressing? How about joining us for one of our mini-retreats to help get your gears in motion? Everyone who participates seems pleased with what they accomplish. See below for the October and November dates. It is a great opportunity to make new friends, too! FREE PATTERN! !Every other week, we will have a new, FREE pattern available to all who come in. The patterns will be for items that are quick to make—for yourself, or for a gift. DRAWINGS MONTHLY: Each time you make a purchase, you may put your name in a jar for a chance to win a $25 gift certificate. Drawings will be held on the first business day in September, October, November, and December! The more purchases you make in that time frame, the better your chances to win! BI-WEEKLY SALES AND HOT DEALS: We will announce these specials in our newsletters and on Facebook. You won’t want to miss out on these. Quantities will be limited on the “Hot Deals,” so don’t delay! HOT DEAL #3—October 6-12 only Any Pattern 50%off with purchase of fabric to make it..
Deb Tucker’s Large Square Squared tool is perfect for making big Diamond Square units for your modern quilts or for framing your beautiful embroidery. But what would you say if we told you that it can also be used to make Stacked Squares (like in Storm at Sea), Pineapple Blocks, Snail’s Trail Blocks, and a fancy version of a Flying Goose called Birds of Paradise? This class will explore the uses of this big, versatile, two-piece tool set. With it, your creativity will know no bounds! Participation in prior TU classes is NOT required for this class. 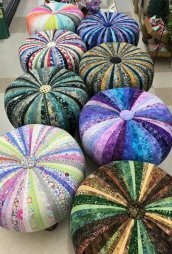 Audra Langley will walk you through the construction of this amazing footstool, which you will customize using the jelly roll of your choice. Kits required for this class will be available for purchase when you sign up for this class. Class size limited to 10, so sign up early. You must pay the class fee to reserve your spot in the class. Deadline to sign up is October 13th. We will be offering a mini-retreat in October and November. We will meet at 10 am and sew until whenever. You will not believe how much you can get done! Come and join us for one day or for all days! Thursdays and Fridays are BYO brown bag lunch, and pot luck on the weekend! YOU MUST CALL THE SHOP TO RESERVE YOUR SPOT!! It is in our classroom, so space is limited. There is no fee for these retreats. Come to a fun handwork group that meets monthly each FIRST TUESDAY of the month from 10 am-1 pm in the Quilt and Sew classroom. If you want to learn new techniques, find portable projects, and share the latest in English paper piecing, red-work, embroidery, and more, this group is for you! Come join us, bring a project or idea, and bring a dish to share. Call the shop for more details. 270-466-5000.